This mushroom lentil soup recipe, shared from the New England Soup Factory Cookbook, is a hearty blend of brown lentils, vegetables, and a variety of mushrooms. I love the texture because each bite is wonderfully chewy. The scallions, parsley, and thyme finish it with a burst of green crunchiness. This is my dad’s favorite soup. I always drop a quart for him the day I make it. I usually check later to see how he and my mom liked it, but then I learn that my mom never even got one bite of it! portobello, shiitake, and oyster mushrooms. Saute an additional 3 minutes. Add the lentils, sherry, stock, and bay leaves. Bring to a boil. Reduce the heat to medium and simmer for l l/4 hours. Remove from the heat and discard the bay leaves. Add the thyme, parsley, scallions, vinegar, salt, and pepper. Stir well. Serve mushroom lentil soup garnished with a bit of fresh chopped parsley. 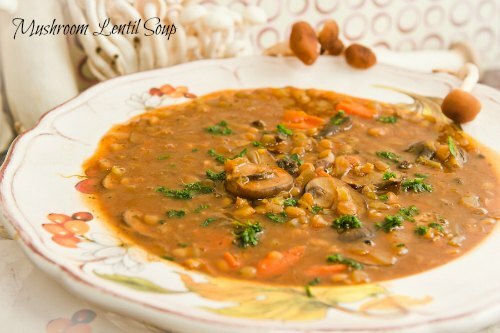 This mushroom lentil soup recipe was a guest post provided by Marjorie Druker, founder of the New England Soup Factory. She loves to share the the simplicity and joy of cooking at home.